Some of the Rascals pausing for a snack. L to R: George “Spanky” McFarland, “Buckwheat,” “Porky,” “Alfalfa,” and Darla. Do you remember the Little Rascals? If you grew up in the 1950s, as I did, you probably do. They were some of the favorite TV entertainment for us Baby Boomers of the Eisenhower years. The Hal Roach Studio had started filming those short comedies starring the absolutely adorable kids, in 1922. The original main star was a black boy they called Sunshine Sammy Morrison. 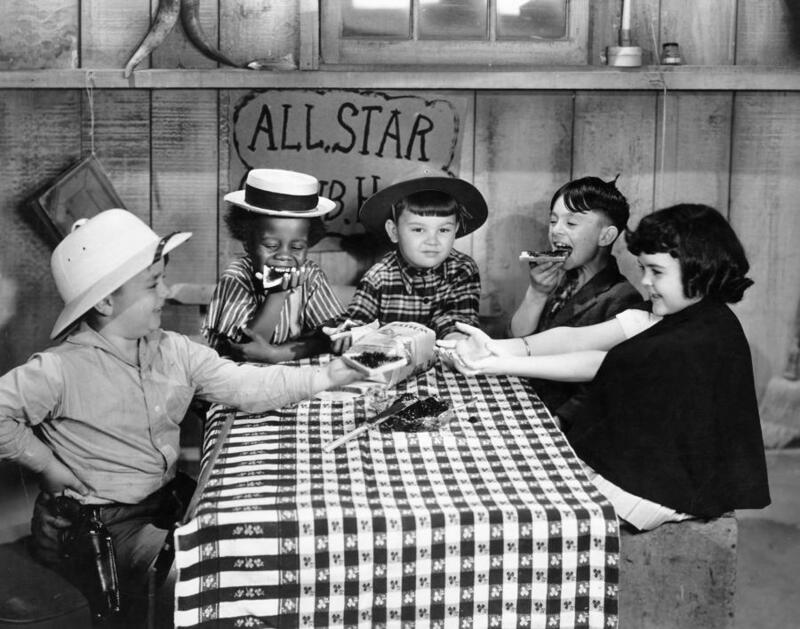 He even helped select some of the other kids from among the many who auditioned to become part of “Our Gang,” which is what the series was called during the silent film days. Besides Mickey Daniels, the silent shorts featured the beautiful blonde little girl Mary Kornman, who was the target of Mickey’s affection in a number of them; and Joe Cobb, the “fat boy” who continued with the gang through the first two sound shorts, both released in 1929. Interestingly, the fat, jolly Joe, who retained his excess weight all his life, lived to the ripe old age of 85, while Mickey and Mary, both slim and healthy looking as children, each died in their 50s. In an age when, according to the liberal historians, black Americans were always the victims of “White racism,” “back of the bus,” etc., in the early sound Rascals films, it seemed to me that black gang members Allen “Farina” Hoskins and, starting a couple of years later, Matthew “Stymie” Beard, got the lion’s share of the funniest lines in the plots, with the White kids often seeming to be their “straight men.” Nevertheless, the White kids were in a big majority, and the plots basically centered around them. Starting with the first sound shorts in 1929 and for a year or so later, a very young boy named “Wheezer” got a surprising amount of camera time, as did Norman “Chubby” Chaney, who had succeeded Joe Cobb as the “fat boy” in the group. Jackie Cooper came along in 1930, and his good looks and acting talent quickly brought him to the fore, although after about a year with the series he departed to star with Wallace Beery in “The Champ,” and other first-run movies. Then, in about 1932, George McFarland made his very young debut. He was “Spanky,” and even at three or four years of age, the short, stocky lad had a way of taking charge of situations, of becoming the gang’s “leader,” even over kids older than him. It was obvious that Hal Roach viewed him as the new pivot around which the series would turn. Around about 1935, another “new kid” appeared on the block. He was taller than Spanky, slim, with dark hair that the studio stylists managed to fashion into a long point on the top of his head (wonder whose idea that was?) Yes, he was Alfalfa, who became Spanky’s best friend over time, and began sharing the central role with him, as they got into many hilarious situations. And then came a beautiful little girl to provide a permanent love interest for Alfalfa: Darla Hood. A bit later, another little black boy, who was called “Buckwheat” and usually wore what appeared to be some kind of a girl’s dress, joined the Rascals. His buddy, who was always with him, was a chunky little White boy named Porky. Buckwheat did almost all the talking for the two, such as it was, as Porky seldom said anything. But his face often wore a mischievous expression, and he would sometimes do things to screw up situations that Spanky had carefully arranged, causing “the boss” to blow his top in exasperation. And, of course, last but not least, was Pete. No, Pete wasn’t a two-legged Rascal who could talk. He was their beloved dog: medium-sized, short haired, black, white and maybe some tan, with a ring around one of his eyes. Pete was always there; the gang didn’t make a fuss over him, but you knew they loved him, and he loved them. “Come on, Pete!” someone would yell as they set off on another adventure. And Pete would trot right along. if there was some type of loud noise; lick his chops on cue if someone produced some food; and once, when the climactic scene called for him to suddenly break from the circle of the gang, race down the street to a shop whose owner had cheated them with the wrong doll, jump up into the display window just as the owner was getting ready to lock up for the night, grab the right doll off the shelf, and race out the door again, he pulled it off with aplomb. Even factoring in some expert directing, Pete was smart, resourceful, and obviously understood the plots, at least to some extent. 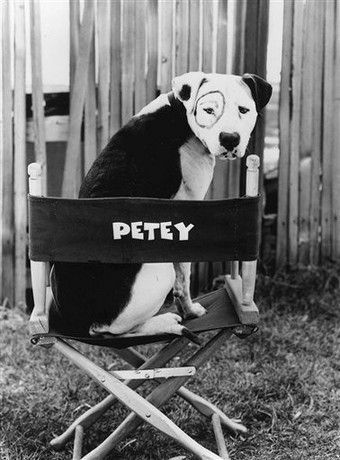 And Pete wasn’t the only one of the animal species who appeared regularly in the Little Rascals shorts. The favorite other non-human species in many of the movies were monkeys. The Rascals encountered them in many situations, and usually managed to deal with them amicably, with the monkeys usually furnishing some comic relief. The one I remember particularly was when some of the Rascals were roaming around in a big mansion (I told you they were likely to wind up just about anywhere), and Stymie happened to run into a monkey. The animal playfully ran off, with Stymie chasing him. When the two entered a room with a big, elaborate chandelier, the monkey leaped up onto it, then began throwing down the globes, one at a time, to shatter on the floor, nearly hitting Stymie, as he yelled, “Stop that! Come down here!” Who knows? Maybe it just happened, with them lucky enough to catch it on film. Of the Little Rascals shorts I’ve viewed, I’d say the funniest scene was in a film where several kids who were on their way on a train to a reform school, persuaded the Rascals to change clothes with them and replace them on the train. The laughs were many, and they peaked when a drunk fireworks salesman who had gotten onto the train, left his tray of crackers, chasers, skyrockets, and other explosives in the Pullman car where the Rascals were sleeping, and somehow a lit cigarette fell into it. The ensuing scene probably had everybody in the various theaters rolling in the aisles, as the Rascals enjoyed the “explosive” results, and the chasers pursued the black porter down the aisle of the sleeping car and out the door several times. But I think the all-around funniest short was “The Kid From Borneo,” in which the character from the title — actually a grown black man, wearing spooky-looking jungle attire — was a sideshow attraction in a circus who got loose and ran off, yelling, “Yum yum! Eat ’em up!” every time he came within whiffing distance of any food. Several of the Rascals fled around and through the home of one of them, pursued by him, and then when that Rascal’s parents came home, the “kid” chased the adults clear across the field. If you even get to watch that one, I predict you’ll laugh until your sides ache. I know I have, every time I’ve seen it. By the late 1930s and early ’40s, however, the Rascals had about run their course. All the ’30s stars were getting too old for their parts, and public tastes change with time. The Rascals eventually went their separate ways, moving into adulthood. I’ve already told how Mickey and Mary died in their 50s, Mickey of acute alcoholism. And of Joe Cobb’s making it to 85, despite his rotund build. George “Spanky” McFarland had a varied adult career, a happy marriage, three children, and lived until his early 60s. Darla Hood died of a heart attack at age 47 as a result of a severe allergic reaction to medication she had been given in connection with surgery. And Carl “Alfalfa” Switzer’s story is sad. He was not the most popular among his fellow Rascals, due to his practical jokes on the set and other unpleasant behavior. He got small roles in a few films as an adult — especially as the young man who opens the floor by pushing an electric button in “It’s A Wonderful Life,” dumping James Stewart and Donna Reed into a swimming pool. Switzer married, fathered a child, but the marriage didn’t last. By the time he was 31, in 1959, he had become involved in some petty criminal activity, and wound up being killed in a fight in the home of a man he said owed him money. Two years ago, which is the most recent time I was able to find information from, there were only five of the former Rascals still alive. None of their names were familiar to me. But they’ll always live in the short comedies, which were among the most unique, and successful, ever made. And if you get a chance to watch some of them, please don’t confuse them with the feature “The Little Rascals,” released in 1994. That one was a facsimile. The Roach films were the Real McCoy. ← Assert your authority, President Trump! Thank you for the trip down memory lane, Old Corporal! Another fine piece of writing! Enjoyed it very much! I remember watching the Little Rascals,in the late 1970’s. They used to show them, and other old shows along with cartoons on channel 41, I think, when it was an independent station. I guess they didn’t have much new or original programming to show in the afternoons. it is interesting that Buckwheat was treated as an equal in the show. Maybe Hal Roach had “liberal” ideas about race. I remember one of the shorts in which a boy with two sisters, don’t remember which one, was hoping his pregnant mother would have another boy, until he read that one out of four babies is Chinese. The other kids assured him that Chinese people weren’t bad and they visited the family of a Chinese friend. His mother had twins, both girls. I also remember the Three Stooges. I was surprised to learn not too long ago that Moe was almost the complete opposite of his onscreen persona. Thanks for your comments, David. Yes, screen comedians were often different in real life than they were on the screen. In the Laurel and Hardy movies, Ollie was the leader and initiator (although things often went haywire on him); Stan was the simple-minded, humble follower. In real life, Stan was the creator of a large majority of the team’s gags and routines, while Babe (Ollie’s nickname) was content to do all his work before the cameras, and play golf, do his gourmet cooking and raise his garden the rest of the time.